My way of viewing moments of passion, fraught with heated emotions, is to step back and ask: “O.K., what’s next?” Thus, when I saw the strong reactions to President Trump’s remarks the Friday before Week 3 of the NFL season, I immediately wondered about Week 4 and beyond. I suspected the pitched emotions of last week would recede, with team owners wanting to get back to their business of playing football games, in turn marginalizing players and advocates and leading to inevitable tensions. And I think we are there. Although players and owners were literally and figuratively connected for a purpose, many team statements seemed carefully—and similarly—crafted as to not wade into difficult themes. 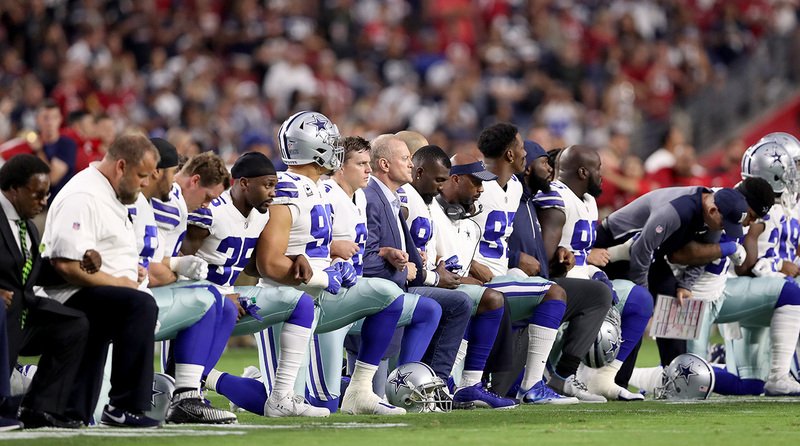 The statements were not synchronized to what many players were protesting, rather morphing into a softer protest demanding “unity” (Who doesn’t want unity?). Although Colin Kaepernick has not addressed the media this year, he was forthright in discussing the basis of his activism last year, protesting unequal treatment of minorities by the police and, more broadly, racial injustice. Since that time, players became inspired and empowered by Kaepernick. Kaepernick has come to stand for a resistance movement in this country, fueled further by the current administration’s leadership on the topic of race and by the events of Charlottesville and beyond. The movement behind Kaepernick may have happened without these events, but certainly not to this level of fervor and intensity. And as I have said from the beginning, he is a much bigger story unsigned than signed. Inspired by Kaepernick, other players, Michael Bennett, Anquan Boldin and Malcolm Jenkins among them, have not only raised similar issues but also brought those concerns to Capitol Hill. Many players were taking stands on and off the field long before Week 3 and plan to do so going forward despite many wanting to put a bow on this issue. Emotions fade—they always do—but commitment to a cause does not. With the emotion of Week 3 dissipating upon Week 4 and expected to further diminish going forward, the “unity” test between players and owners is upon us. There is a definitely a sense from ownership and the league, detailed in an ESPN column, as if to say to players: “That was nice for a week, now let’s get back to football.” President Trump tweeted that he had a good conversation with Cowboys owner and NFL rainmaker Jerry Jones, who knelt with his team—with a face that looked like he just ate a lemon—and now, viola, Cowboys players are standing with hand over heart. There seems to be a “stick to sports” message coming from ownership, perhaps in responses to stakeholders such as sponsors, networks and fans. In my class at Villanova last week, professor Glenn Bracey, a scholar in social movements and race, said this of “stick to sports”: “‘Stick to sports’ is particularly offensive when you’re talking about a group of people who are among the wealthiest and known people of color in the country. What you’re basically saying is, ‘Dance for me boy.’ I consider it a form of co-optation.” You can see that entire discussion here. Having worked as a team executive for a decade, this is an issue that resonates in many ways behind the curtain. Although I never dealt with an issue like this, there are constantly issues, most of which rarely bubble up to the surface, between players and players, players and coaches, players and management, coaches and management, etc. Teams that diffuse these inevitable tensions separate themselves from ones that do not. NFL locker rooms are not as harmonious as many think; there are levels of tension from issues as benign as the music choice in the weight room to more serious issues of interpersonal frictions. Including injured reserve and practice squad; we are dealing with roughly 70 players from a variety of different backgrounds and views on the world. What has happened in the past couple weeks can serve to exacerbate existing tensions within that space. NFL owners and league management would seem to now want to “stick to sports,” but it will not be easy. The league’s position on the anthem, stated immediately following the Kaepernick firestorm hit 13 months ago, is that Players are encouraged, but not required, to stand for the anthem. The NFL policy, interestingly more tolerant than that of the more progressive NBA (which requires standing), has set a precedent immunizing players from discipline for sitting or kneeling in protest. The NFL and NFLPA, which seem to only communicate in court (as now regarding Ezekiel Elliott), did release a statement Tuesday about being “committed to an ongoing dialogue” about social activism. Like earlier “unity” comments, that seems safe and comfortable (who can have a problem with "ongoing dialogue?"). Perhaps an immediate step for the NFL is for the league to commit to words that may be a little less comfortable, words such as those Seahawks coach Pete Carroll used a week ago. Carroll zoomed past “unity” to “stand against hate and dehumanization and equality for all people.” Again, these are just words, but they are more purposeful that what we have seen from the NFL and most teams. This is uncomfortable territory, but experience has taught me that nothing meaningful is truly achieved while inside comfort zones. The “What’s next” in this situation will be a true test for NFL teams and Roger Goodell. The league must balance concerns of players invested in some form of protest against owners/management/sponsors/media/fans wanting to “move on.” We are at a moment in time; league history will be defined by how this is handled. 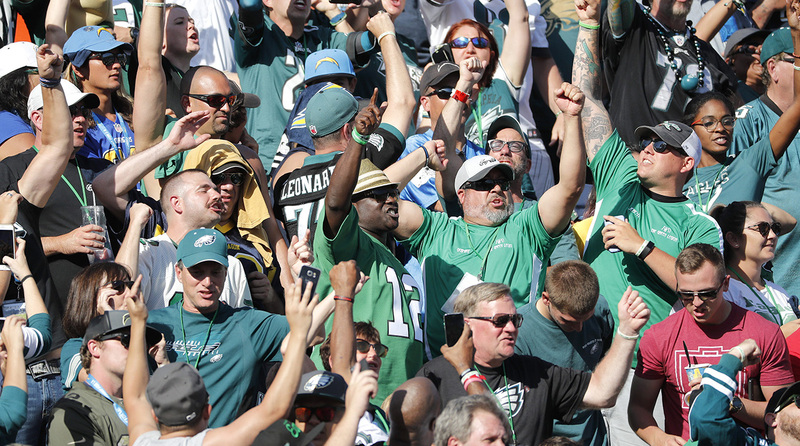 Eagles fans overran the StubHub Center on Sunday, but it wasn't much different in San Diego. 1. A Chargers “home game” populated largely by Eagles fans in their 28,000-seat building drew calls for the team to move back to San Diego, yet the same problem existed there. When the Packers played in San Diego, we referred to the stadium, full of Cheeseheads, as Lambeau Field West. NFL teams from the Northeast and Midwest will always have fan bases traveling to California and California will always have less passionate fan bases. 2. My sense is, fans and media are more concerned about the L.A. stadium situations—one team in a stadium too large (Rams) and one in a stadium too small (Chargers)—than the league and owners. They see these are temporary solutions on the way to the Shangri-La being built for them in Inglewood, speed bumps to untold revenues emanating out of that building. 3. The Bears probably wish the Draft were held before free agency. Were that the case and the Bears had drafted Trubisky, they would not have signed Glennon for $16 million this year and $18.5 million guaranteed. Of course, the NFLPA would fight any attempt to move the Draft ahead of free agency as that would further depress NFL contracts. Now, Glennon will make his $1 million per game from the bench. The Eagles were in a similar situation with Sam Bradford and Carson Wentz 14 months ago, but fortune smiled upon them with the Vikings’ desperation, and Wentz now looks like a budding star with a full season under his belt. 4. As I wrote here, the Jets “tanking” narrative before the season, evidently due to their releasing of veteran players, was folly. After being a bad team with players like Ryan Fitzpatrick, Brandon Marshall, Darrelle Revis, and David Harris, they moved to a younger team and are now 2-2. Yes, they are not a playoff team, but they are 2-2 and better to be losing while young than losing while old. 5. Rams beat Cowboys, Panthers beat Patriots, Bills beat Falcons. All on the road. The only thing we know about the NFL is that we don’t know anything.